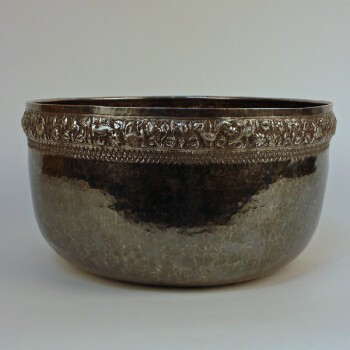 Buddhist temple ceremonial bowl, 95% pure silver, 92 troy ounce, Thailand, E.20th C., 15" dia. x 8½" tall. Incised, carved, repoussee silver Buddhist temple ceremonial bowl, handcrafted of 950/1000 pure silver and weighs 92 troy ounces. This exceptionally large bowl is finely decorated with an intricately detailed band circling the outer rim with floral and leaf, birds, turtles, shrimp, swimming fish, crab, and sea life motifs. Lanna style and acquired in northern Thailand near the Myanmar border. Dating from the early 20th century and measures 15" diameter x 8½" tall.